← Reassessing the approach of the Learn the Signs. Act Early. campaign. Key findings. CDC’s Learn the Signs. Act Early. team proudly announces the launch of its Promising Practices collection. 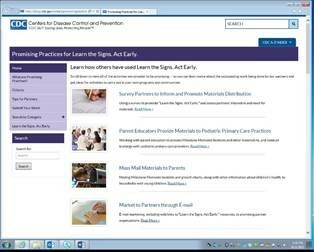 The collection showcases how partners across the country have promoted Learn the Signs. Act Early. messages and materials among families with young children and the organizations, health care professionals, and early care and education providers who serve them. The Promising Practices collection includes activities that show great promise in promoting awareness of the importance of tracking a child’s developmental milestones and acting early on concerns. It was designed to inspire others to adopt and adapt activities into their own programs and communities. Visit the innovative, searchable Promising Practices collection to learn more, and share the link with others in your organization and community. Bookmark the site and visit it regularly—as partners continue to do outstanding work, the collection will continue to grow!